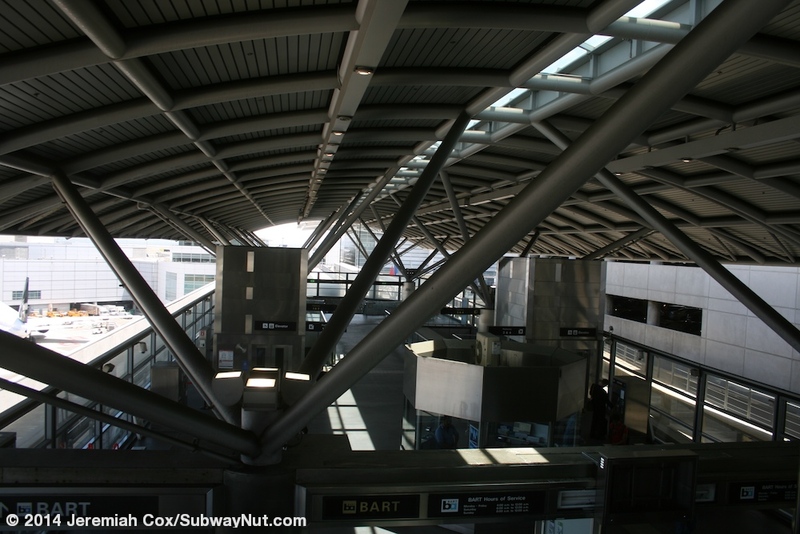 The San Francisco International Airport (SFO) Station (BART), Garage G/BART (AirTrain SFO) is located towards the outside of Garage G with the stub-end of the BART tracks ending a bit before the Main Hall of the International Terminal. 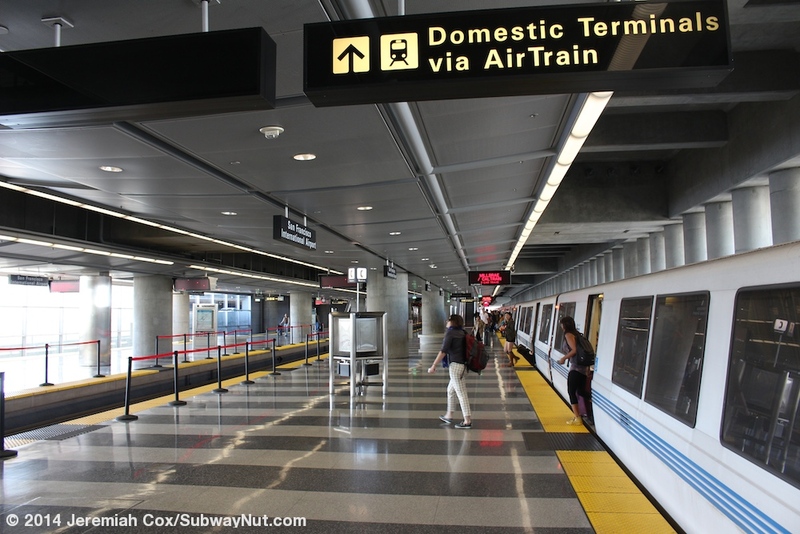 The combined AirTrain SFO Station has BART on a still elevated but lower level and the SFO AirTrain on a level just above with its much shorter island platform and platform screen door area above the southern (non-stub) end of the BART platforms. BART has three tracks and two island platforms with the middle track serving both sides of the island platform. The BART tracks form a wye (with two sets of flyer over tracks) off of the main Bart Line that continues south to Millbrae. The extension into SFO is extremely short and consists of basically just the two sets of two-track flyover wye tracks that come off the main line from Millbrae in separate directions and meet directly above US-101 before the very short extension enters airport property. 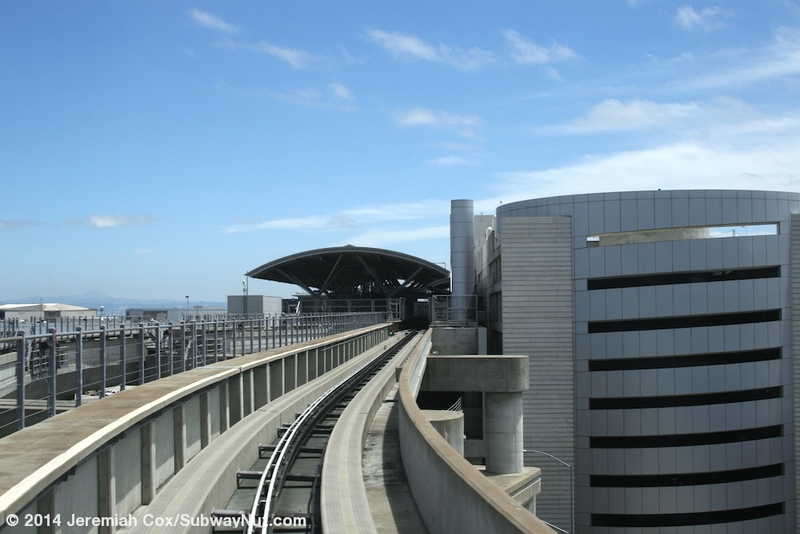 The entire 5 mile long SFO AirTrain system (including this station) opened officially on March 3, 2003 with a 'soft' unofficial opening the week before. 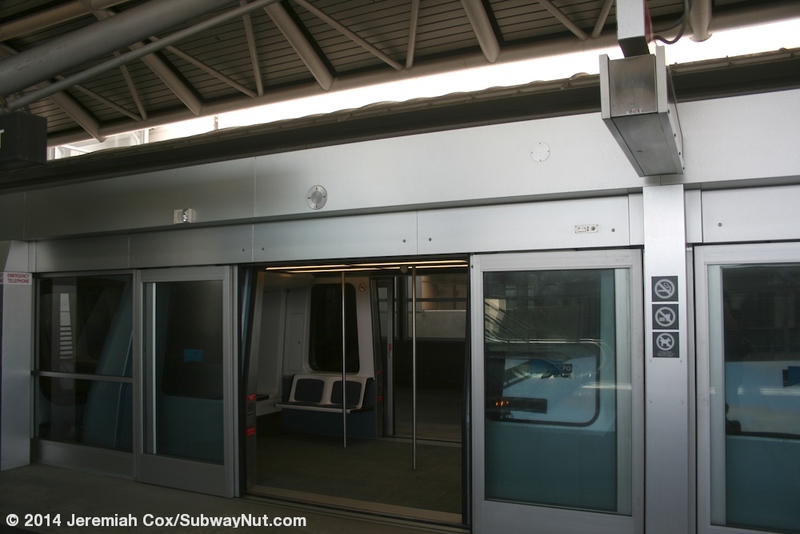 It is a rubber-tired airport Bombardier Innova APM 100 People Mover system; that has two lines. The Red Line runs as a continuous inner loop in the clockwise direction connecting five terminal stations, this station and a separate station for parking garage A. The Blue Line makes a loop on the opposite counter-clockwise outer track and leaves the airport on a two-station extension to West Field Road and then the Airport's Rental Car Station. 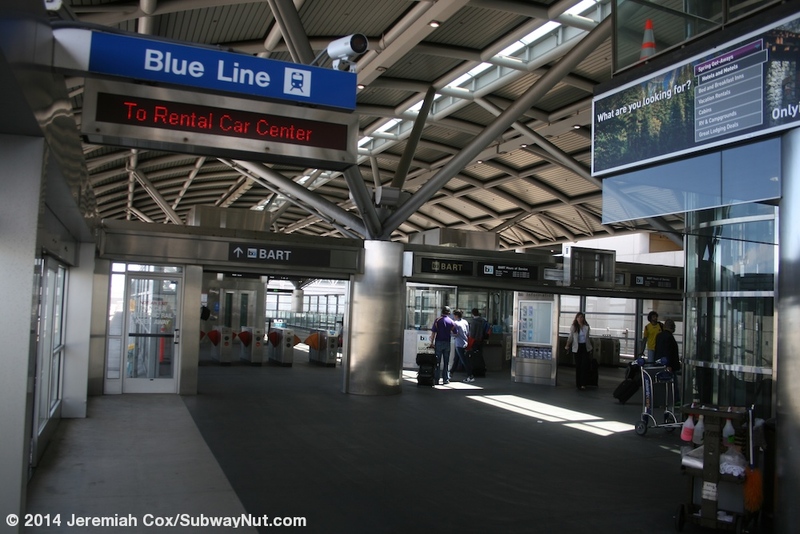 Service is free of charge although a $20 AirTrain fee is charged per rental car unless asked to be specifically waved if the user didn't take the AirTrain. 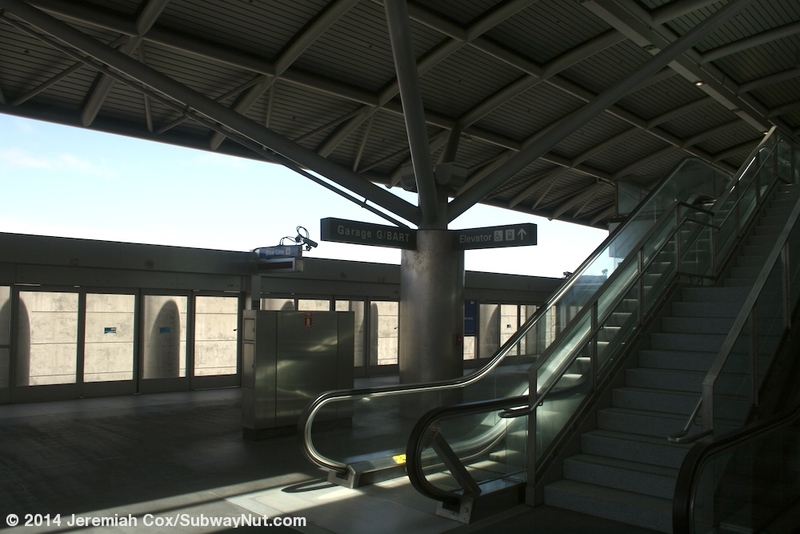 The BART station beneath finally opened on June 23, 2003. 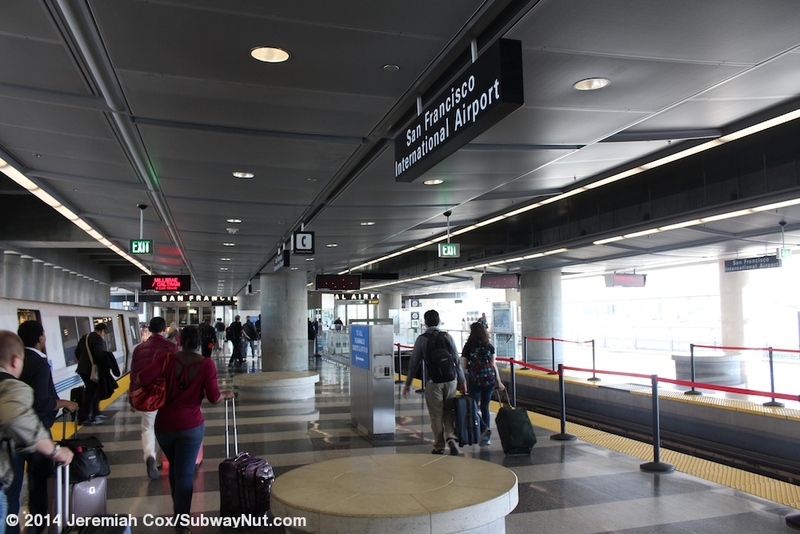 All BART riders except as of July 2013 airport employees with the proper ID badge are charged a $4 Airport fee (designed to pay for the SFO extension) on top of their regular distance-based BART fare to enter and leave the airport BART station. 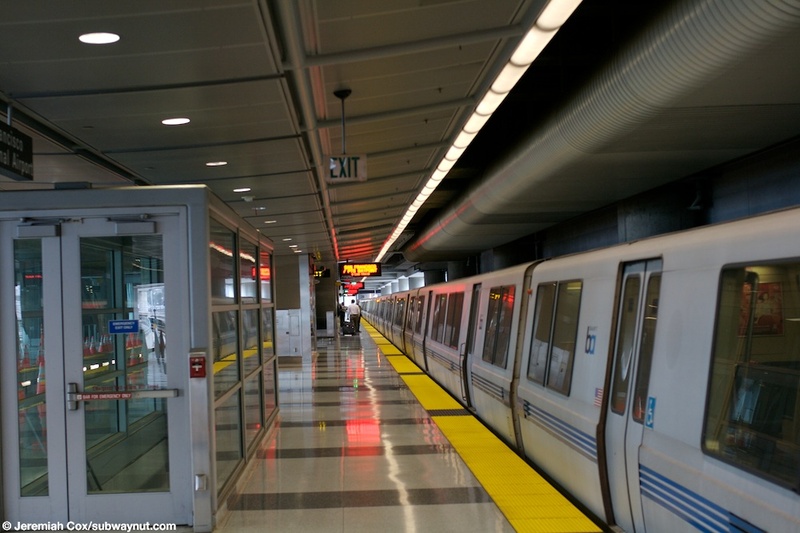 BART riders have two possible fare control areas at the station. 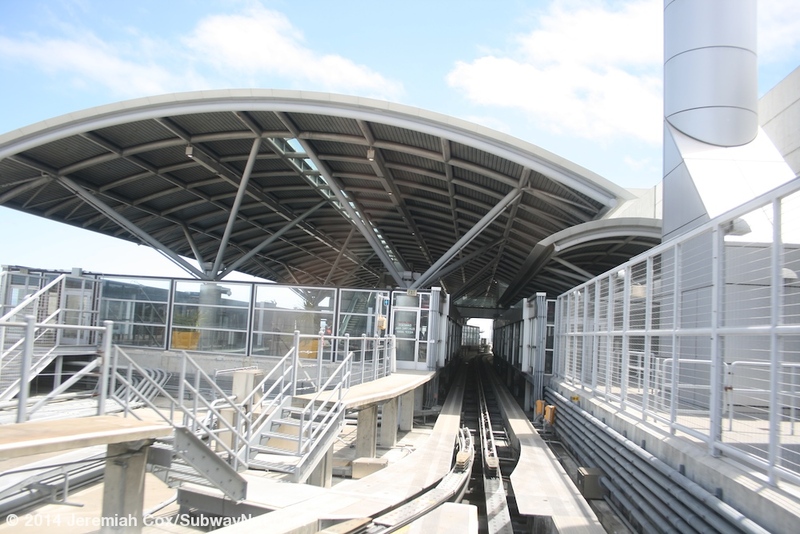 The eastern ends of the two platforms, beyond the bumper block of the middle track have merge and become one large fare control area. 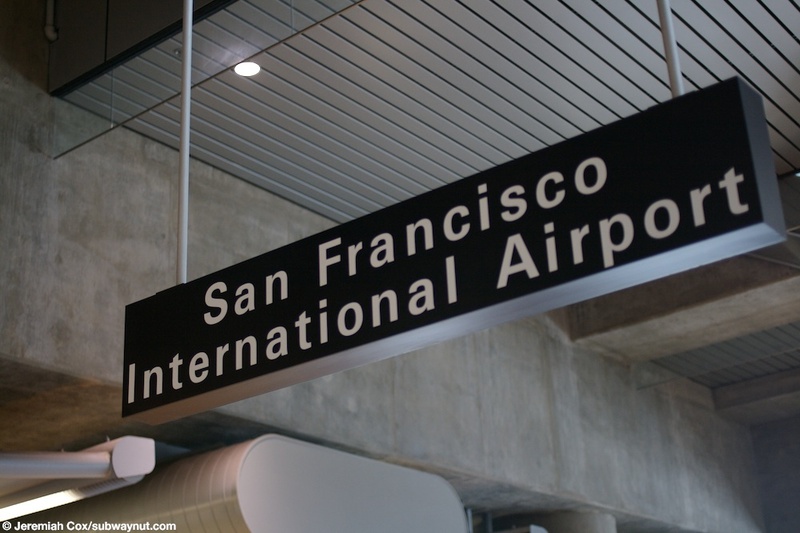 This fare control area has silver letters spelling out San Francisco International Airport above the main bank of fare gates. 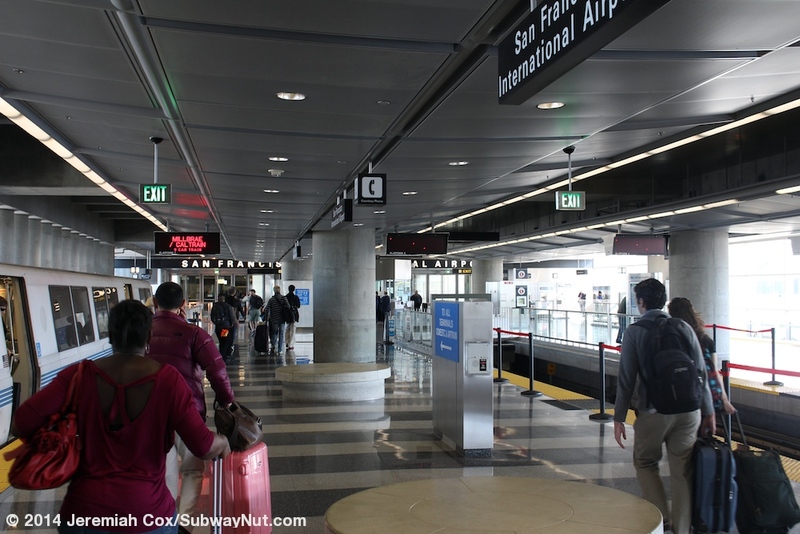 Riders passing through the fare gates then reach a passageway along parking garage G that leads to the main International Terminal where its ticket counters (and the International Arrival area) is. 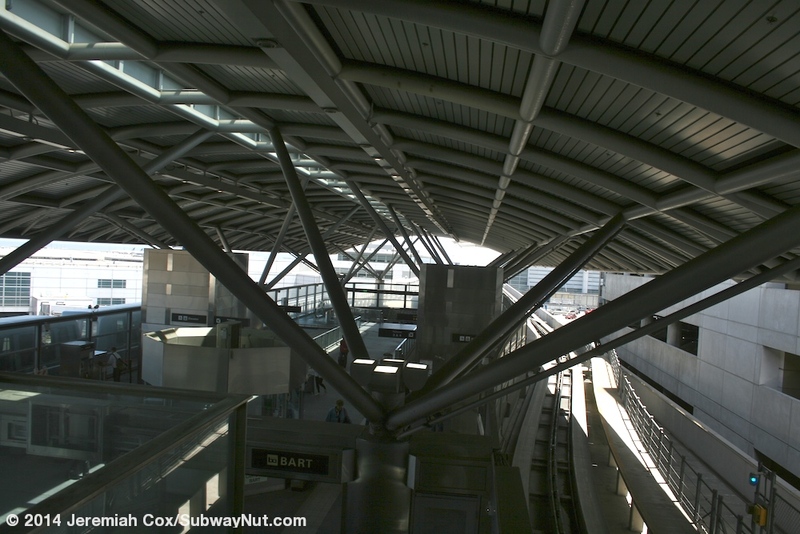 This end of the station should be used by passengers flying out of the International Terminal. 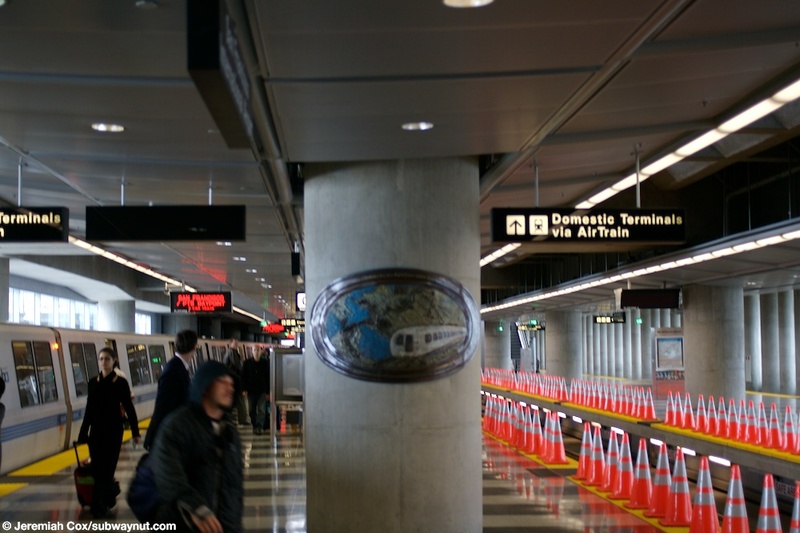 Passengers for airlines using Domestic Terminals 1, 2 or 3 should use one of two escalators (one combined with a staircase) and an elevator up from each platform to a smaller fare control area directly above the BART platform and between the two AirTrain SFO trackways (it's a rubber tired system). 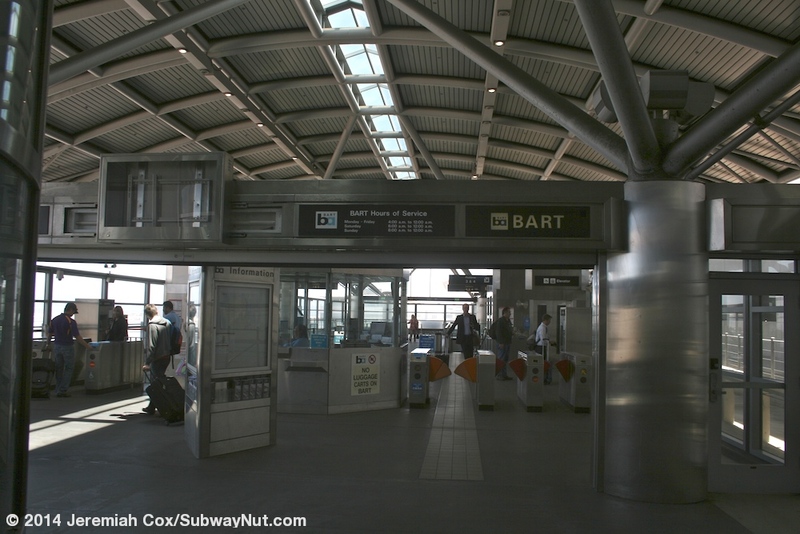 After passing through the fare gates passengers are immediately at the Garage G/BART SFO AirTrain station. 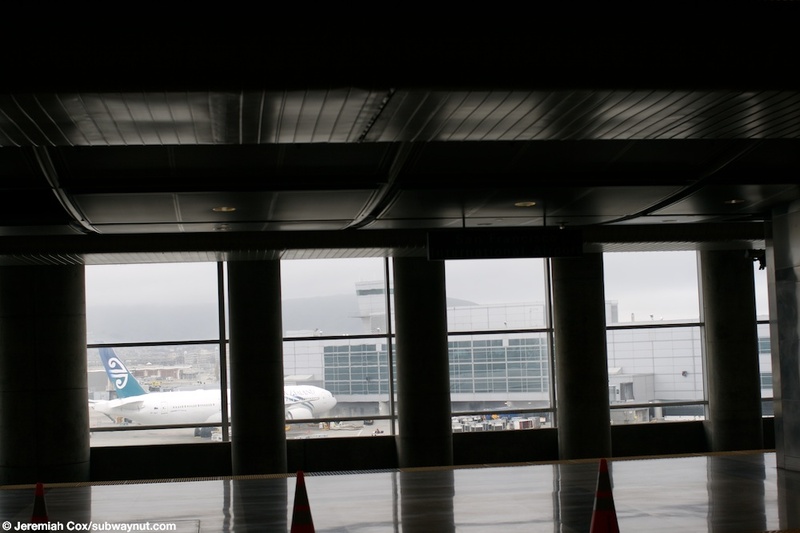 From the SFO AirTrain platform a wide staircase staircase with escalators on either side leads up to the entrances into Garage G (international hourly parking) the other duty this station serves and connects with the passenger walkways into the Main Hall of the International Terminal. 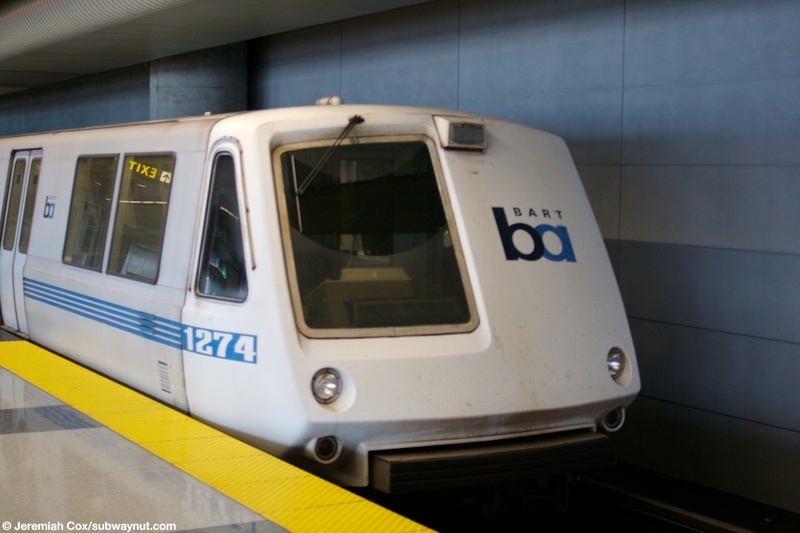 BART service to and from the airport has varied over the years, but the three tracks that end in bumper blocks directly at the end of the tracks are vastly underutilized. 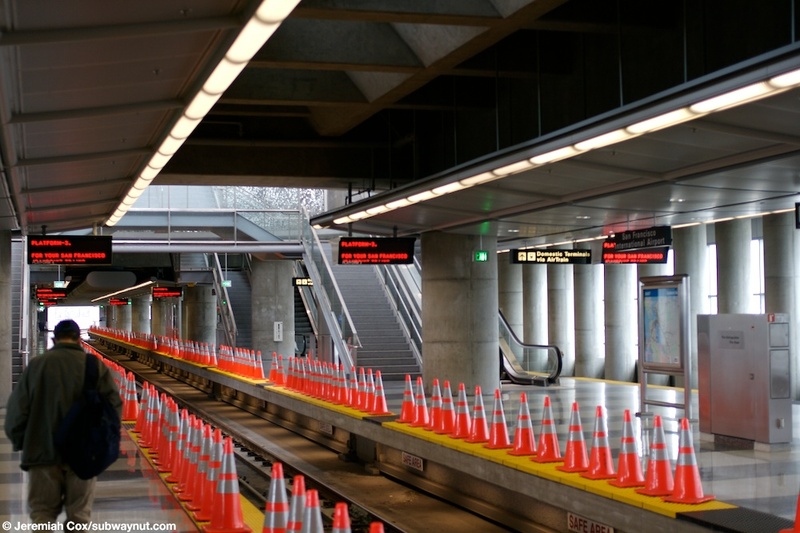 Ridership hasn't been anywhere near the projections from when the extension was built. When the station opened in 2003 two services were operated to and from the station; a Shuttle train (Purple on the maps) running every 20 minutes to and from the Millbrae BART station and mainline service to Downtown San Francisco, the East Bay and Dublin/Pleasanton. Terrible ridership on the Shuttle Train resulted in its discontinuation on February 9, 2004. 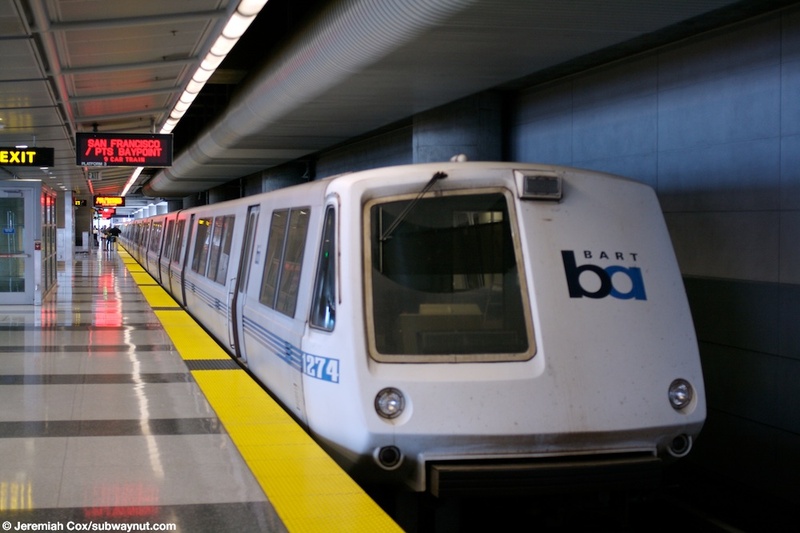 The Shuttle Train was replaced by service to and from Pittsburg/Bay Point (along with Richmond service during peak hours) with at least one of the lines running in round-robin service to Millbrae. Millbrae-bound trains running via SFO enter the station, after a brief pause (made faster by having an operator positioned already at the other end of the station), leave the station again for the short trip to Millbrae/Caltrain (as the signs say, for passengers going from points north to Millbrae its an extra 3-6 minutes of travel time). On September 12, 2005 all service south of Daly City was replaced by only the Dublin/Pleasanton Line running at all service hours to Millbrae via SFO. 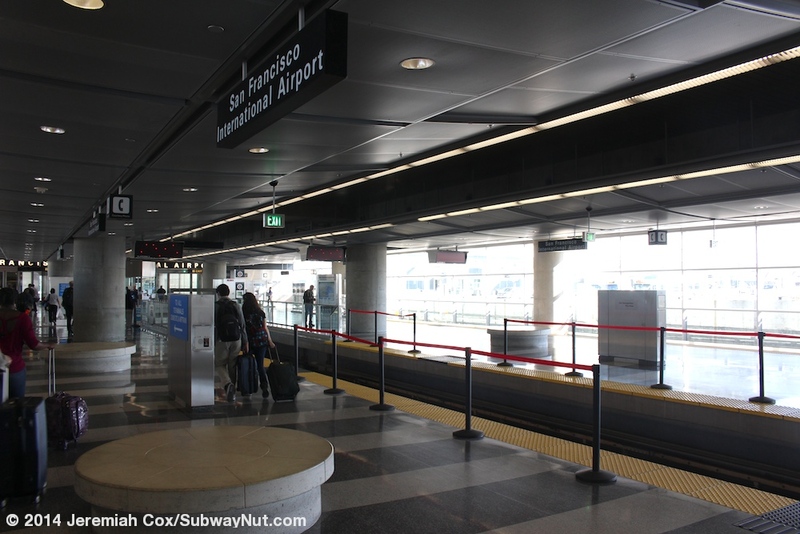 On January 1, 2008 SFO lost direct service to and from Millbrae and Caltrain all together, with the Pittsburg/Bay Point line taking over all service and terminating at SFO. 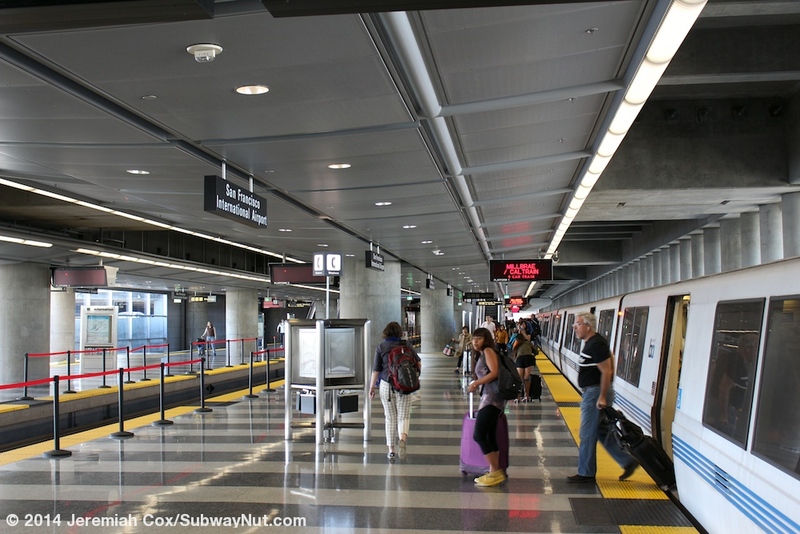 Caltrain riders had to contend with a timed transfer at San Bruno. On September 14, 2009 round-robin service via the wye was re-instituted during evenings and weekends by but direct Millbrae service via the San Bruno transfer was kept during the week. Today this service from just one line results in only one track and platform (the southernmost two) needing to be in operation during weekday hours when there is just one train running every 15 minutes to and from San Francisco and the East Bay. On Evenings and weekends the north platform is opened for round-robin service around the wye with Millbrae-bound trains using the northern most track and Pittsburg/Bay Point trains the southern-most. The middle track remains closed off with black flexible ropes (cones were in use for awhile) and has never seen regular service.